Scandinavia is a historical and geographical region including the three kingdoms of Denmark, Norway, and Sweden. It is characterized by common ethno-cultural heritage and mutually intelligible North Germanic languages. The term has also been used to refer to the Scandinavian Peninsula or to the broader region more correctly known as the Nordic countries which includes Finland, Iceland, and the Faroe Islands. In linguistic terms, Scandinavia can be expanded to include the areas where Old Norse was spoken and where the North Germanic languages are now dominant, thus also including Iceland and the Faroe Islands. However, the Finns form a distinct linguistic and ethnic group, with a Finno-Ugric population that has incorporated features from both Eastern and Western Europe. Being a purely historical and cultural region, Scandinavia has no official geopolitical borders. The region is therefore often defined according to the conventions of different disciplines or according to the political and cultural aims of different communities of the area. The construction of a specific Finnish polity is the result of successful decolonization. The politico-cultural location of Finland is a moving one. It has shifted from being a province in the Swedish Empire to an autonomous unit in ‘Eastern’ Europe, then to an independent state in ‘Northern’ Europe or ‘Scandinavia. After the joining the European Union, Finland has recently been included in ‘Western Europe’. Geographically, the Scandinavian Peninsula includes what is today mainland Sweden and mainland Norway. A small part of northwestern Finland is sometimes also considered part of the peninsula. In physiography, Denmark is considered part of the North European Plain, rather than the geologically distinct Scandinavian Peninsula mainly occupied by Norway and Sweden. However, Denmark has historically included the region of Scania on the Scandinavian Peninsula. For this reason, but even more for cultural and linguistic reasons, Denmark—Jutland on the Jutland peninsula of the European continent, along with Zealand and the other islands in the Danish archipelago—is typically considered part of the Scandinavian region also by the Scandinavians themselves. A wider definition of Scandinavia, sometimes used in the English-speaking world, includes Finland, Iceland, and the Faroe Islands. However, this larger region is officially known as the “Nordic Countries,” a political entity and cultural region where the ties between the countries are not only historical and cultural, but based on official membership. The historic popular usage is also reflected in the name chosen for the shared, multi-national airline, Scandinavian Airlines System, a carrier originally owned jointly by the governments and private investors of the three countries. The use of the term Scandinavian for the culture of the Nordic region is reflected in the name chosen for the various promotional agencies of the Nordic countries in the United States and around the world, such as The American-Scandinavian Foundation, established in 1910 by the Danish-American industrialist Niels Poulsen. Today, the five Nordic heads of state serve as the organization's patrons and according to the official statement by the organization, its mission is "to promote the Nordic region as a whole while increasing the visibility of Denmark, Finland, Iceland, Norway and Sweden in New York City and the United States." The official tourist boards of Scandinavia sometimes cooperate under one umbrella, such as the Scandinavian Tourist Board. The cooperation was introduced for the Asian market in 1986, when the Swedish national tourist board joined the Danish national tourist board to coordinate international promotions of the two countries. Norway entered one year later. Together with Finland, these Nordic countries participate in joint promotional efforts in the United States through the Scandinavian Tourist Boards in North America. Estonia has applied for membership in the Nordic Council, based on its cultural heritage and close linguistic links to Finland, despite Estonia's being regarded as one of the Baltic countries. All Baltic states have shared historical events with the Nordic countries, including Scandinavia, over the centuries. 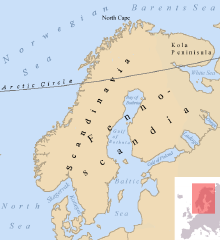 The terms Fennoscandia and Fenno-Scandinavia are used to include the Scandinavian Peninsula, the Kola Peninsula, Karelia, Finland, and occasionally Denmark under the same term, alluding to the Baltic Shield, even though Denmark is on the North European Plain. The geography of Scandinavia is extremely varied. Notable are the Norwegian fjords, the Scandinavian Mountains, the flat, low areas in Denmark, and the archipelagos of Sweden and Norway. When Finland is included, the moraines (ice age remnants) and lake areas are also notable. 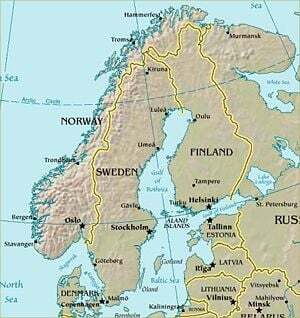 The Scandinavian Peninsula measures roughly 1,245 miles (2,000 kilometers) north to south. The climate varies from north to south and from west to east; a marine west coast climate typical of western Europe dominates in Denmark, southernmost part of Sweden and along the west coast of Norway reaching north to 65° North, with orographic lift giving more than 78 inches (2,000 millimeters) per year precipitation (maximum of 138 inches or 3,500 millimeters) in some areas in western Norway. The central part—from Oslo to Stockholm—has a humid continental climate, which gradually gives way to subarctic climate further north and cool marine west coast climate along the northwestern coast. A small area along the northern coast east of North Cape has tundra climate due to lack of summer warmth. The Scandinavian Mountains block the mild and moist air coming from the southwest, thus northern Sweden and Finnmarksvidda plateau in Norway receive little precipitation and have cold winters. Large areas in the Scandinavian Mountains have alpine tundra climate. The codified standard languages of Scandinavia are often classified as belonging to either an East Scandinavian branch (Norwegian, Danish and Swedish) or a West Scandinavian branch (New Norwegian, Icelandic, and Faroese). Most dialects of Danish, Norwegian, and Swedish are mutually intelligible, and Scandinavians can easily understand each other's standard languages as they appear in print and are heard on radio and television. The reason why Danish, Swedish, and Norwegian are traditionally viewed as different languages rather than dialects of one common language is that they each are well-established standard languages in their respective countries. They are related to, but not mutually intelligible with, the other North Germanic languages, Icelandic and Faroese, which are descended from Old West Norse. Danish, Swedish, and Norwegian have, since medieval times, been influenced to varying degrees by Middle Low German and standard German. A substantial amount of that influence was a by-product of the economic activity generated by the Hanseatic League. Norwegians are accustomed to variation, and may perceive Danish and Swedish only as slightly more distant dialects. This is because they have two official written standards, in addition to the habit of strongly holding on to local dialects. The people of Stockholm, Sweden and Copenhagen, Denmark, have the greatest difficulty in understanding other Nordic languages. For people who are studying Scandinavian languages, basic Norwegian is often the first language learned. This is because Norwegian is extremely similar to written Danish, and also very similar to oral Swedish. They can thus easily expand their knowledge further. The Scandinavian languages are, as a language family, entirely unrelated to Finnish, Estonian, and Sami languages, which are Finno-Ugric languages distantly related to Hungarian. Due to the close proximity, however, there is still a great deal of borrowing from the Swedish and Norwegian languages in the Finnish, Estonian, and Sami languages. The earliest records of human activity in Scandinavia are sparse and the interpretations of the records from the Nordic Stone Age (10,000 B.C.E. – 1700 B.C.E.) often conflict. The oldest archaeological evidence of human habitation in Scandinavia has been found in what is now Denmark and consists of flint tools from 9500-9000 B.C.E. Some scholars argue that the population slowly spread into what is present-day Sweden during the ensuing millenniums. Archaeological finds of this era are the petroglyphs of southern Sweden and Norway, grave goods from several large burial mounds, and offering finds from what is believed to have been sacrificial sites. Because of the wide access to water, Sweden's early inhabitants came in waves from many surrounding areas. Societies in Sweden remained preliterate tribes and chiefdoms until the emergence of writing on rune stones in the Viking Age. In 4200 B.C.E., fired pottery, systematic farming, and permanent settlements developed in southern Scandinavia and spread northward. Hundreds of Mediterranean-style megalithic graves dated 3300-2000 B.C.E. have been found in Denmark and southern Sweden. The early hunter-gatherers and farmers were succeeded by a new ethnolinguistic group between 2500 and 2000 B.C.E., the so-called boat axe, battle axe, or single-grave people, named for their stone weapons and graves. They were Indo-European nomads from the eastern Urals who spread across much of northern Europe and may have also established cultural dominance over the earlier peoples of southern and central Scandinavia. This period was followed by the Nordic Bronze Age (1700–500 B.C.E. ), one of the richest periods in the Nordic region, especially in southern Scandinavia. The conditions were geologically and topographically very similar to those in the modern-day Scandinavian landscape, but the climate was milder. An elite is believed to have emerged during this period, a chieftain-trader class with possible roots in the social structure of the battle axe people. During the early stages of the Scandinavian Viking Age, Ystad in Scania and Paviken on Gotland, in present-day Sweden, were flourishing trade centers. Norwegian and Danish Vikings traveled south and west; Swedish Vikings traveled east, going to Finland, the Baltic countries, and Russia, whose name probably comes from the Slavic name for these Vikings: Rus. Their routes followed the rivers of Russia south to Constantinople, now present-day Istanbul, Turkey. Remains from 600-700 C.E. of what is believed to have been a large market have been found in Ystad. In Paviken, an important center of trade in the Baltic region during the ninth and tenth century, remains have been found of a large Viking Age harbor with shipbuilding yards and handicraft industries. Between 800 and 1000, trade brought an abundance of silver to Gotland and according to some scholars, the Gotlanders of this era horded more silver than the rest of the Scandinavians combined. Saint Ansgar introduced Christianity around 829, but the new religion did not begin to fully replace paganism until the twelfth century. The period between 1100 and 1400 was characterized by internal power struggles and competition among the Nordic kingdoms, including struggles for territory and power. Denmark, forged from the Lands of Denmark (including Jutland, Zealand and Scania (Skåneland) on the Scandinavian Peninsula.. The island Gotland in modern-day Sweden was initially also part of the Danish realm. Sweden, forged from the lands of Sweden on the Scandinavian Peninsula (excluding the provinces Bohuslän, Härjedalen, Jämtland, and Idre & Särna, Halland, Blekinge and Scania of modern-day Sweden). The three Scandinavian kingdoms were united in 1397 in the Kalmar Union by Queen Margrete I of Denmark. Sweden left the union in 1523 under King Gustav Vasa. After Sweden's secession from the Kalmar Union, civil war broke out in Denmark and Norway. The Protestant Reformation followed. When order returned, the Norwegian Privy Council was abolished—it assembled for the last time in 1537. A personal union, entered into by the kingdoms of Denmark and Norway in 1536, lasted until 1814. Three sovereign successor states have subsequently emerged from this unequal union: Denmark, Norway, and Iceland. Denmark-Norway is the historiographical name for the former political union consisting of the kingdoms of Denmark and Norway, including the Norwegian dependencies of Iceland, Greenland, and the Faroe Islands. Under Danish rule, Norway nonetheless kept its separate laws, coinage, and army, as well as some institutions such as a royal chancellor. Norway's old royal line had died out with the death of Olav IV, but maintaining a hereditary kingdom was an essential factor for the Oldenburg dynasty of Denmark-Norway in its struggles to win elections as kings of Denmark. In the 1645 Treaty of Brömsebro, Denmark-Norway ceded the Norwegian provinces of Jämtland, Härjedalen, and Idre & Särna, as well as the Baltic Sea islands of Gotland and Ösel (in Estonia) to Sweden. The Treaty of Roskilde, signed in 1658, forced Denmark-Norway to cede the Danish provinces Scania, Blekinge, Halland, Bornholm and the Trøndelag region of central Norway to Sweden. The 1660 Treaty of Copenhagen forced Sweden to return Bornholm and Trøndelag to Denmark-Norway, and to give up its recent claims to the island Funen. The Dano-Norwegian union was formally dissolved at the 1814 Treaty of Kiel. The territory of Norway proper was ceded to the King of Sweden, but Norway's overseas possessions were kept by Denmark. However, widespread Norwegian resistance to the prospect of a union with Sweden induced the governor of Norway, crown prince Christian Frederick (later Christian VIII of Denmark), to call a constituent assembly at Eidsvoll in April of 1814. The assembly drew up a liberal constitution and elected him to the throne of Norway. 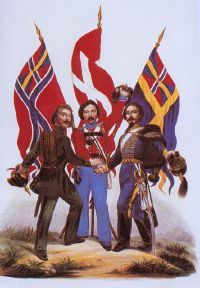 Following a Swedish invasion during the summer, the peace conditions specified that King Christian Frederik had to resign, but Norway was to keep its independence and its constitution within a personal union with Sweden. Christian Frederik formally abdicated on August 10, 1814 and returned to Denmark. The parliament elected King Charles XIII of Sweden as king of Norway on November 4. The union between Sweden and Norway was dissolved in 1905, after which Prince Charles of Denmark was elected king of Norway under the name of Haakon VII. The modern usage of the term "Scandinavia" has been influenced by Scandinavism, the Scandinavist political movement which aimed to abolish absolute monarchy, propagated for a federalist state, including Sweden, Denmark and Norway. It was active in the middle of the nineteenth century, mainly following the First War of Schleswig (1848-1850), a prolonged conflict between Denmark and insurgents of the continental duchies of Jutland. Denmark retained its control of the Jutland, and in the intervening years before the Second War of Schleswig (1864), Sweden and Norway contributed considerable military force to the Danes. That year signaled the end of the Scandinavian political movement when the Swedish parliament denounced the promises of military support made to Denmark by Charles XV of Sweden: The members of the Swedish parliament were wary of joining an alliance against the rising German power. Denmark's attempts to annex the (Danish) Duchy of Schleswig, which together with the (German) Duchy of Holstein had been in personal union with Denmark led to the Second War of Schleswig followed in 1864, a brief but disastrous war between Denmark and Prussia (supported by Austria), despite successful North Sea blockades of the Prussian and Austrian navies by Denmark. Schleswig-Holstein was conquered by Prussia, and after Prussia's success in the Franco-Prussian War, a Prussian-led German Empire was created, and a new power-balance of the Baltic Sea countries was established. The Swedish king also proposed a unification of Denmark, Norway, and Sweden into a single united kingdom. The background for the proposal was the tumultuous events during the Napoleonic wars in the beginning of the century. This war resulted in Finland (formerly the eastern third of Sweden) becoming the Russian Grand Duchy of Finland in 1809 and Norway (de jure in union with Denmark since 1387, although de facto treated as a province) becoming independent in 1814, but thereafter swiftly forced to accept a personal union with Sweden. The dependent territories Iceland, the Faroe Islands, and Greenland, historically part of Norway, remained with Denmark in accordance with the Treaty of Kiel. Sweden and Norway were thus united under the Swedish monarch, but Finland's inclusion in the Russian Empire excluded any possibility for a political union between Finland and any of the other Nordic countries. A Scandinavian political union was not achieved; however, there was a Scandinavian Monetary Union established in 1873, lasting until World War I, with the Krona/Krone as the common currency. To the extent that the cultural identity of separate nations can be generalized, Scandinavia with its intertwined histories and changing boundaries can be characterized by inward-looking, outwardly influential societies that hold traditions close while accepting new people and ideas. Scandinavians cherish individual freedoms and place a high value on privacy, discretion, and tolerance. They play active roles in defensive and peace-keeping forces as members of NATO and the United Nations. Having so much in common, distinctions hold importance. For Danes, their language represents their unique identity. For Finns, the history and traditions invoked by their national epic, the Kalevala, tells their story. The Norwegians, and the Icelanders regard their Viking heritage with pride. A list of notable Scandinavians would include Eliel Saarinen, who together with his son Eero Saarinen, designed and built some of the most distinctive structures of the mid-twentieth century, first in their home country of Finland, and then later working in the United States. Edvard Grieg, the Norwegian humanitarian musician is celebrated for his music and work for social justice. Authors as diverse as Hans Cristian Andersen and Isak Dinesen (Karen Blixen) represent the Danish tradition in literature. Sweden's Ingvar Kamprad founded what is considered the most successful mass-market retail business in the world, IKEA, in his family's barn as a child. Carl Larsson and Edvard Munch are two examples of the depth and variety of Scandinavian painting. Sweden and Norway share in the awarding of Nobel Prizes, the Peace Prize awarded in Oslo, and the prizes for, among others, economics, chemistry, and literature being awarded in Stockholm. ↑ Kenneth R. Olwig, "Introduction: The Nature of Cultural Heritage, and the Culture of Natural Heritage—Northern Perspectives on a Contested Patrimony." International Journal of Heritage Studies 11(1) (March 2005): 3-7. ↑ U.S. Library of Congress, Country Studies, Finland and the Swedish Empire. Retrieved May 22, 2018. ↑ U.S. Library of Congress, Country Studies, The Rise of Finnish Nationalism. Retrieved May 22, 2018. ↑ Reflections on Political Thought in Finland Finnish Yearbook of Political Thought (Jyväskylä University Printing House, Jyväskylä, 1997). Retrieved May 22, 2018. ↑ Uffe Østergård, "The Geopolitics of Nordic Identity – From Composite States to Nation States." The Cultural Construction of Norden, Edited by Øystein Sørensen and Bo Stråth (Oslo: Scandinavian University Press, 1997), 25-71. ↑ Hans Christian Andersen and Music - I am a Scandinavian, The Royal Library of Denmark, the National Library and Copenhagen University Library. Retrieved May 22, 2018. ↑ The American-Scandinavian Foundation, About the American-Scandinavian Foundation. Retrieved May 22, 2018. ↑ The Scandinavian Tourist Boards in North America. Retrieved May 22, 2018. ↑ “Urban misunderstandings,” Norden This Week, January 14, 2005. Retrieved May 22, 2018. ↑ Birgit Sawyer and Peter Sawyer, Medieval Scandinavia: from Conversion to Reformation, Circa 800-1500 (Minneapolis, MN: University of Minnesota Press, 1993, ISBN 0816617392). ↑ Britta Olrik Fredriksen, "The History of Old Nordic Manuscripts IV: Old Danish," in Nordic Languages: An International Handbook of the History of the North Germanic Languages, edited by Oskar Brandle, et al. Balsved, Johnny E. The 1st Schleswig War 1848-1850, Danish Naval History,September 22, 2005. Retrieved May 22, 2018. Jones, Gwyn. A History of the Vikings. Oxford: Oxford University Press, 1968. This page was last modified on 22 May 2018, at 22:00.